Oh how I love the feeling of anything that promotes relaxation; better sleep and certainly glowing good skin. Not many things would have such a combination. Except a bubbling soak in a jacuzzi. On this day when my friend invited me for the R &R. I quickly packed my travel bag and off I went. [Sorry had to put sticker on the face because I did not ask her for permission to use our photo on public blog.] Thank you dear friend for the gesture. Loved it and look forward to many more adventures. Back to the R&R weekend, it was a wonderful distraction that I needed for my aching muscles, tenses up joints, stiff back and simply to clear my head. So it all began with the warm bathe then quickly jumped into the jacuzzi which had hot water bubbling and my back leaning on the massage balls that increased the intensity down the spine and to the legs back to the buttocks then the thighs then back to rolling against the stiffness and sore muscles that were aching. After a good amount of time in the hot jacuzzi I had so many benefits that I got from it. A glass of wine during the bubble soak is a wonderful idea accompanied with good conversation. Nothing will feel more luxurious. Not only did it soothe my muscles but I was completely relaxed and ready for a good nights sleep. 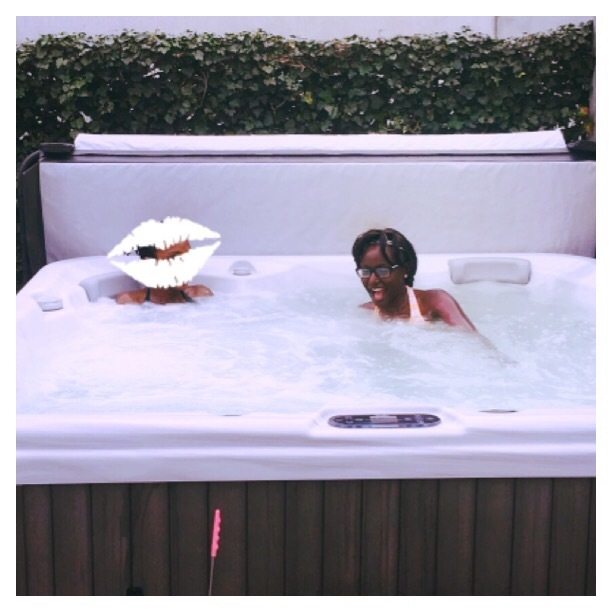 If you are having a stressful day, or just want to improve your blood circulation or just to get that steam on your skin the jacuzzi is the answer. Go ahead and have enjoy the company as you help your body beat the daily stress of our busy lives.